The change of the seasons is an exciting time. I usually imagine the earth in its new place in relation to the sun, and smile at how and why things begin to change. Here in South Texas, the summer season hits like a wave of moist heat, and we all look at each other and say, "it's here" and run inside (where the air conditioning is), or if we have time, we run to the water to cool off. School is out and the crops are growing, or it is time for a vacation -- all this says it is time enjoy natures way of making the heat tolerable. So head to the nearest stream or lake for a dip and cool the senses. 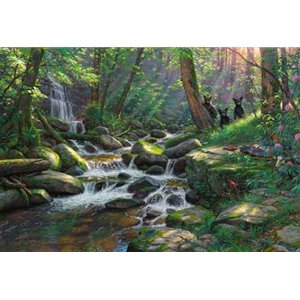 In my Seasons of Life series, the common elements in each painting are the Smokey Mountain streams and the black bears. Here the cubs have strayed from the near protection of their mother and are "exploring" the woods, like I used to do as a kid. I would spend hours with my BB gun or 22 rifle down at Jack's creek in East Texas, and would almost always end up in the water. Those were carefree days and I never knew what I would run across on those adventures because life is always full of surprises. So take time to explore, to relax, and try to get lost in the big out doors this summer and maybe you, too, might enjoy a few Summer Delights.